The most successful efforts at intertwining world/folk music with jazz artfully maintain an "of the people/by the people" feel. The best of these in turn feature a core group of talented musicians who within this structure use the complex improvisational techniques and instrumental voicings of jazz to explore new musical territory. 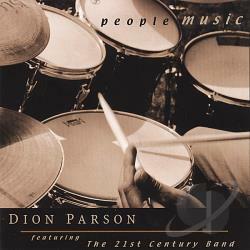 People Music , led by drummer Dion Parson, is just such a session. Parson has surrounded himself with inventive jazz musicians who also continue to maintain a healthy respect for their music's cultural roots and rhythms. A prominent and authentic Virgin Island feel, courtesy of Parson and bandmates saxophonist Ron Blake and bassist Reuben Rogers, adds an uplifting edge to cuts that also draw on funk, bop, Brazilian, chitlin' circuit B3 and reggae. The driving interplay between Parson and the great hand drummer Robert Thomas Jr. on cuts like the funkily happy "Promise to our Future" and the more mellow "The River Runs" expose complex rhythms in differing settings. While the former is a wonderfully up-beat optimistic look forward, the latter is a mellow, reflective take on the lovely Monty Alexander composition. Jeremy Pelt adds his attacking trumpet to Blake's full mellow tone on both Jackie McLean's boppishly playful ode to his daughter "Little Melonae" and the lighthearted Parson-composed closer, "Child's Play." "Mellow D" begins as such, with a Blake opener that somewhat suddenly segues into some serious reggae courtesy of Ron Jackson's perfectly placed staccato guitar and Carlton Holmes' organ riffs. Reuben Rogers' featherlike touch against a soothing percussive backdrop, made more so by vocalist Senise Jannah, allows Blake to succeed with "Lullaby for Belle" until Carlton Holmes' breezy piano awakes on the Ron Jackson tune "To Us." After Blake presents Jackson's very catchy melody, the composer is front and center displaying quick fingers that lead into a full ensemble sound. "Brazilia" is true to its name, as a boppish beginning finds Blake and Jackson on acoustic, soloing against a tropically rhythmic surrounding. "NGP for Sonny P" pays fitting tribute to the powerful Hammond B3 artist Sonny Phillips as Holmes' juicy organ, along with Blake and Jackson, let everyone know "this be the blues." With uplifting takes on standards and newly composed music that portends a bright future, People Music is a joy.